Welcome to the March Pinterest Challenge Blog Hop, hosted by My Pinterventures. If you aren't familiar with the Pinterest Challenge, it's a monthly event that challenges us to not just be pin hoarders, but to actually make it happen! So, for this month I chose to make a rose out of empty paper towel tubes and use it to dress up a cardboard container. My pin inspiration happens to be roses made from empty toilet tissue rolls. I fell in love with the design shape and thought it quite different from the usual toilet roll crafts. I chose to use paper towel rolls instead because some think using toilet rolls in crafts might be unsanitary - although you can now buy something called paper craft tubes that look just like the real thing at craft stores. Also, I tweaked the method used to my liking just a bit in making the rose! 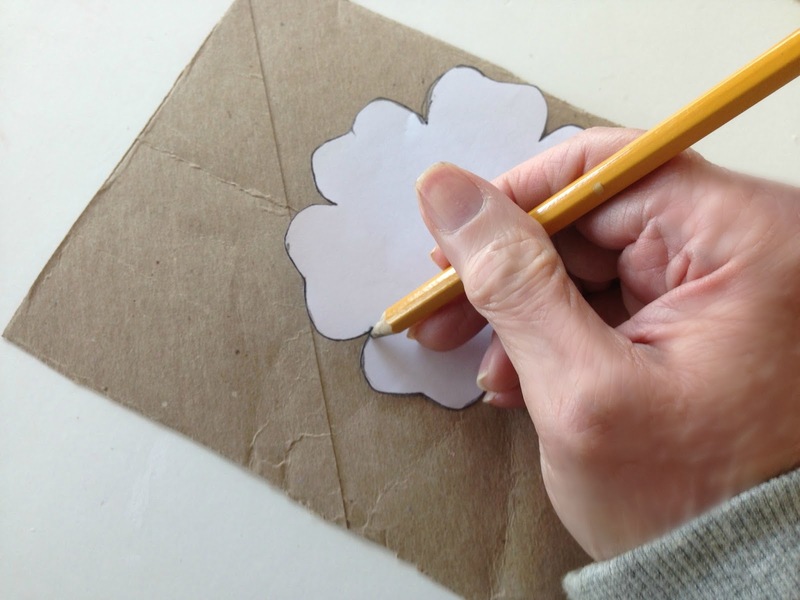 Begin by cleaning off any paper residue on the tubes with a damp cloth and let dry. This is a picture of the toilet paper roll rose I admired on Pinterest. Pretty and perfect, isn't it? Too perfect, in my opinion, for a toilet paper roll flower! And below is a copy of the pattern that was used to make the rose. I just couldn't see how the petals in the rose became so wavy and smooth using a plain pattern like this. I know the edges were curled but you can see how wrinkled the paper roll is, and it is rather rough, not smooth, to start. So I drew and cut out a six petal flower pattern with curvy edges to help compensate the wavy look. And then outlined it on flatten paper tubes . 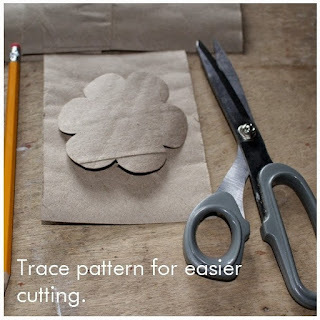 . .
and cut out five flower pieces. To begin forming the rose, I cut out one petal from the six petal flower . . .
and use it to . . .
roll into a closed cone shape for the center of the rose. Next, I cut out two petals from a six petal flower to use as the first layer of the rose. Then, cut the flower in half to shape the second layer. The third layer is the four petal cut out. And the fourth layer, is the five petal cut out. The 5th layer is the full six petal flower. I made additional 1" cuts toward the center on each petal to make them easier to curl. Have you ever tried to curl a toilet paper roll? Well, a paper towel roll isn't any easier! It can crack and bend, especially where it's connected and divided if you aren't careful! How on earth is that pin rose so smooth and pretty? Anyway, since I'm using my rose to decorate the top of a cardboard container, I painted all the pieces, including the box, in gold leaf to look like metal. And curled the petal edges after they dried, using a skewer stick. Next, the second layer was glued together at the edges, and the first layer inserted and glued down into the middle of layer two. Layer three was glued together at edges and layer two inserted and glued down into the middle of layer 3. Continue gluing together remaining layers, four and five and inserting previously glued layer in the middle until all layers are glued together for a completed, beautiful rose. 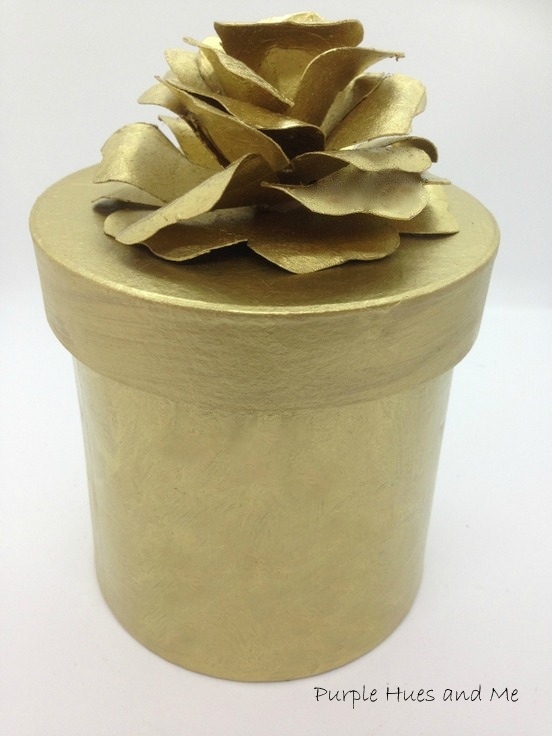 To attach the rose to the top of the gold leaf painted box, glue down an additional full rose layer on top and . . .
glue the completed rose to the center top layer that's there. I'm really loving this paper towel tube rose look! And the gold leaf makes it all look like a beautiful metal container! Just perfect in any décor! and curvy as the original pinned rose appears to be in the photos. There may be a few cracks and nubs along the way. But it's very attractive and worth making none the less! Perfect for any project you might have! Now let’s see what other Awesome things Pinterest inspired! Head over and visit the other hosts to see what they crafted, cooked, built, or tried! This is beautiful and you would never know it was made from a paper towel roll. I think yours looks just as beautiful. What a neat pin to make. Your golden paper towel rose is just beautiful! Thanks for sharing how you made it...your instructions are great. Gail, you have created some lovely flowers over the years and this one may just be at the top of the list. I love that you painted it gold. The tutorial is so detailed, too. Just beautifully done! I can not believe that is made from an empty towel tube!! What a neat idea. Pinned. Amazing what can be made from a cardboard tube! I love the details of this pretty rose and it is a lovely topper for the cardboard container! The gold color makes it all the more elegant. Thanks for the details tutorial too. Pinning and sharing! Very pretty. These would make lovely Mother's Day corsages or corsages for bridal showers. Great tutorial, too. I have been meaning to try my hand at book page flowers. Made one a year ago and haven't tried again since. Wonder if I can even remember how. Very nice! Your paper rose turned out beautifully. Gail this is so pretty I cannot believe you made it from a paper towel tube. Well actually I can and I believe you are the only craftier who is capable of making such stunning roses. What?!?! A paper towel tube? WOW! I would have never known that. Stunning! This is so beautiful. How amazing a lovely rose is created from a lowly paper towel roll. Who knew. A paper towel tube. Makes one want to start saving a lot of things around the house for crafts. Wonderful project Gail. What a great way to use up some of the paper towel and toilet paper tubes! Pinning! I think your paper rose turned out amazing. It may not be as smooth as the original, but it's still pretty and looks perfect on top of your box.